Download our quick guide on how to apply & a list of ALL of our teams HERE! You don't have to go very far or spend a lot of money to make a BIG impact on the world! Check out our DOMESTIC trip opportunities in Texas and across the U.S.A & Puerto Rico. No passport needed, just a heart to serve others! Opportunities for disaster relief, medical, construction, community development, hunger advocacy, and more! 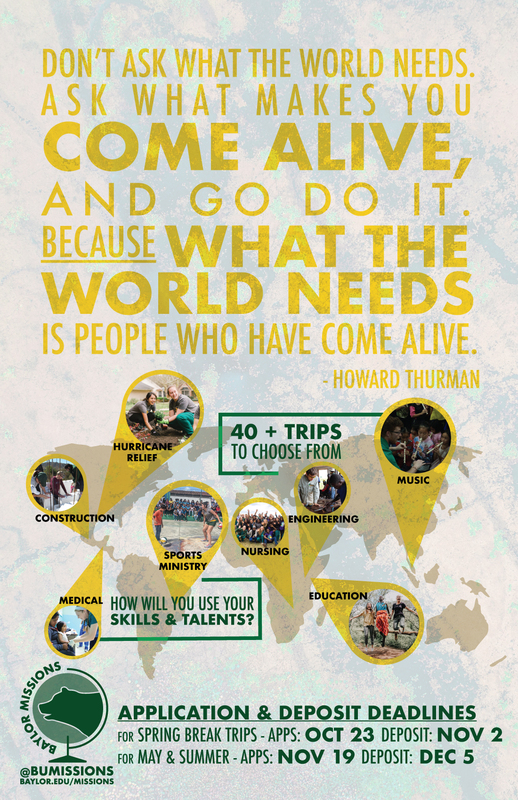 Baylor Missions is excited to provide Baylor students, faculty and staff with a dozen domestic mission trip opportunities for Fall Break, Winter Break, Spring Break, May Mini-Mester, Summer 2! What exactly is Discipline Specific Missions? For more information on any of our upcoming trips, please contact the team leader listed on the team page OR stop by the Bobo Spiritual Life Center to chat with Holly Tate, Assistant Director for Missions: Student Engagement, OR sign up here to let us know what you're looking for! or select "All Opportunities" to see all our teams!